After literally years, Verizon announced today that it will finally be carrying the BlackBerry Pearl Flip smartphone. It's the same phone we know and tolerate, except with a really dumb caveat: it's priced at $129 after rebate. What? Verizon Wireless and Research In Motion (RIM) (NASDAQ:RIMM)(TSX:RIM) announced today the BlackBerry(R) Pearl(TM) Flip 8230 smartphone will be available on the nation's largest 3G broadband network beginning June 19. 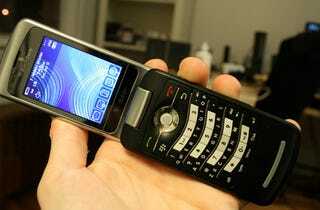 The BlackBerry Pearl Flip 8230 features the industry's leading mobile e-mail and messaging solution combined with rich multimedia capabilities and the high-speed connectivity of Verizon Wireless' broadband network in a popular flip design. - The BlackBerry Pearl Flip 8230 smartphone will be $129.99 after a $70 mail-in rebate with a new two-year customer agreement. Customers will receive the rebate in the form of a debit card; upon receipt, customers may use the card as cash anywhere debit cards are accepted. - VZ Navigator is available for $9.99 monthly access, and Visual Voice Mail is available for $2.99 monthly access. Other charges may apply when downloading or using applications. - Customers can purchase the BlackBerry Pearl Flip 8230 online and in Verizon Wireless Communications Stores. For additional information on any Verizon Wireless products and services, visit a Verizon Wireless Communications Store, call 1-800-2 JOIN IN or go online to www.verizonwireless.com. Business customers can contact their Verizon Wireless Business Sales Representatives at 1-800-VZW-4BIZ.